We are the people of the most Holy Trinity; at the same time, we believe in One God. The Unity and Trinity of God: our faith begins there and ends up there. We get all the insights into these mysteries only because God has deigned to reveal them to us. There is only one God; there are three persons in the One God: Father, Son and Ruha da-Qudsa. The mystery of Incarnation stands close to the mystery of Gods’ Unity and Trinity. God the Son, the second person of the Holy Trinity, became man in order to redeem us. In the Incarnate Son of God, there is only one person: the divine person; but he has two natures: the divine and human natures. Mar Toma Nazranees confess these significant and salvific mysteries whenever they make the sign of the cross on themselves, as it has already been made clear. Ruha da-Qudsa (Holy Spirit) is the Power of God. It is this Power of God that worked in the process of creation, and which banished the first parents from the Paradise as soon as they became disobedient. Every event in the Old Testament happened by the force of this Power. Incarnation, works of Jesus during his life and even his death and resurrection are shown to be works of the Holy Spirit. After Christ, the Spirit leads the Church, which is Christ’s continuation, to her eschatological fulfilment. Many are the references in the Bible to the person and activities of this third person of the Holy Trinity. From them, we first separate his gifts (Is 11, 2) and fruits (Gal 5, 22-23). (1) Wisdom (2) Understanding (3) Counsel (4) Fortitude (5) Knowledge (6) Fear of God (7) Piety. God the Holy Spirit dislikes very much the works of the flesh (Gal 5, 19-21). They are: (1) Immorality (2) Impurity (3) Licentiousness (4) Idolatry (5) Sorcery (6) Enmity (7) Strife (8) Jealousy (9) Anger (10) Selfishness (11) Dissension (12) Party Spirit (13) Envy (14) Drunkenness (15) Carousing. 1. Despair: persistent thought that heaven is unattainable, without making any attempt to trust in the mercy of God. 2. The illusion that heaven can be obtained without self-attempt. 3. Refusal of truth, even after having been convinced of it. 4. Jealousy at the goodness and glory or prosperity of others. 5. Refusal to withdraw from one’s own sins even after having been convinced of it. 6. Not to show any sign of repentance even at the last moment. “O my Lord, may your Holy Spirit come down... And dwell in this Qurbana of your servants and bless it and sanctify it that it may be to us, O my Lord, unto the pardon of debts, remission of sins and the great hope of resurrection from the dead and new life in the kingdom of heaven with all those who have found favour in your presence” (Order of the Raza). "In the Holy Qurbana, the sacramental action becomes complete by the working of the Holy Spirit in the rite of Spirit –Epiclesis." “If any one thirsts, let him come to me and drink. He who believes in me, as the scripture has said, ‘Out of his heart shall flow rivers of living water’”. Now this he said about the Spirit, which those who believed in him were to receive (Jn 7, 37-39). WATER for St. John is the HOLY SPIRIT. 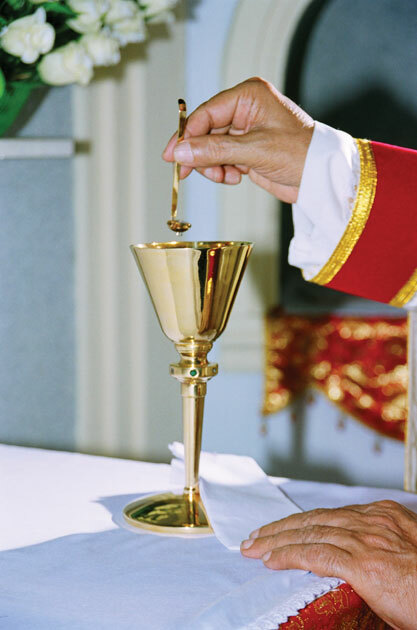 "The rite of mixing water and wine in the Holy Qurbana, is the liturgical action of infusing Holy Spirit into the material gifts of the Eucharist." 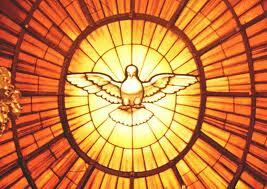 “Let us receive the Holy Oblation and be sanctified by the Holy Spirit” (Order of the Raza). In this critical moment of celebration, they are publicly declaring the role of the Holy Spirit in the process of their sanctification or divinization. The working of the Holy Spirit is clearly proclaimed and confessed in all the liturgical celebrations of Mar Toma Nazranees. There are clear formulas of Spirit-Epiclesis in all their Sacraments and Sacramentals. 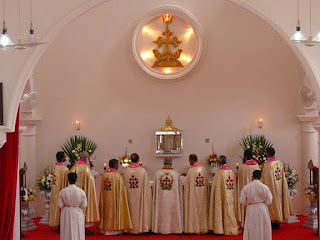 The Liturgy of the Hours (Divine Praises) and Liturgical Year in Mar Toma Margam are proofs of Mar Toma Nazranee-conviction of the working of the Holy Spirit in human sanctification. "We are God’s people; God’s grace flows to us through the Holy Spirit; Holy Spirit is the Spirit of Love, the Spirit of God; He divinizes the faithful - the saints - who celebrate the Qurbana; every faithful is the temple of the Holy Spirit."